Earlier this year, PEBA was in the forefront of social media advocacy when it criticized a proposed bill to increase their current Overseas Workers Welfare Administration (OWWA) fee to US$ 50.00 to help government cover for OFWs repatriation in cases of conflicts or wars. The bill was botched. Then, the yearlong struggle to defer the increase of PHILHEALTH payment was achieved. PEBA is also a signatory to the petition to stop the implementation of RA 10175 known as the Cybercrime Prevention Act of 2012, and to this day the law remains unimplemented. PEBA’s used of social media is not limited to actively taking part in governance, that of engaging other netizens to raise issues and awareness and constructive dialogue with the government and other stakeholders. Also, PEBA continue to make use of social media in raising funds for its philanthropic work of helping distressed OFWs, raising blood money for the OFWs in death row, as well as providing educational scholarship fordeserving kids in particular from the indigenous cultural communities. Andwill definitely make use of social media for the upcoming May 2013 elections. 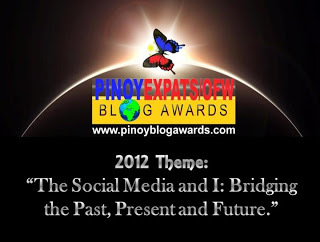 Last year’s theme was blogging as a social remittance, for 2012 , social media is the new blogging, given the importance of social media to most OFWs not only to connect to their families and friends, to post, like and share pictures, videos and inspirational quotes. But for OFWs who take on leadership roles, social media serves as a platform for their advocacy. “It is with pride and honor that I thank the men and women behind the Global OFW Voices for taking part in our successful advocacies especially volunteers from Malaysia, Taiwan, Hongkong, Israel, and largely from the Middle East or Gulf countries and other parts of the world as well as our partners in Manila like Sir Jun Aguilar, Sir Lito Soriano, Ms. Susan Ople, Ms. Ellen Tordessilas, Mr. Tonyo Cruz, Ms. Marissa del Mar and many more who amplifies our voices in fora, dialogues and the media” said grateful PEBA President Kenji Solis. Dubbed as Sama-samang Saya at Parangal sa mga OFW at kanilang Pamilya Pamaskong Handog ng SSS at PEBA, through its partnership with the Social Security System (SSS), this Saturday, 15 December 2012 at 1:30PM at the RM Hall, SSS Main Building, East Avenue, Quezon City, PEBA will hold its 2012 International Blog and Photo Awards. The event is also sponsored by the Villar Foundation and SMART. Also, its partner organization like the Blas Ople Center and Patnubay Riyadh are supporting the event. LBS Recruitment Solutions Corp., Mega Manpower Corporation, Loadmena and VIPinoy are extending help as well. Social Media na ba ang Bagong Blog? Palaos na ba ang blogging? Samantalang ang ibang prestihiyosong blog awards sa Pilipinas ay hindi magdaraos ng kanilang taunang patimpalak, tuloy na tuloy naman ang taunang gawad parangal ng Pinoy Expats/OFW Blog Awards (PEBA) sa darating na Sabado ika-15 ng Disyembre 2012 sa ganap na ika-1:30 ng hapon na gagawin sa RM Hall, SSS Main Building, East Avenue, Quezon City. Dahil sa mas naging tanyag na ang social media tulad ng Facebook at twitter mas kumokonti na rin ang mga nagsusulat ng blog. Ito ay kung pagbabasehan ang konting bilang ng mga lumahok ngayong taon kumpara sa nakaraan. Masasabing palaos na nga ang blogging at mas maraming aktibo ngayon sa social media. Bilib kami Sa’Yo. At ang mga lahok at nanalong larawan ay makikitang naka-display sa SSS Gallery. Sa mga nagnanais na dumalo at makiisa sa gagawing parangal, mangyari lang na bumisita sa http://www.pinoyblogawards.com/ para sa mga impormasyon o mag-sign-up gamit ang link na ito – http://bit.ly/PEBA2012 . Kaagapay din ng PEBA ang Villar Foundation at SMART, gayundin ang LBS Recruitment Solutions Corp., Megamanpower Corporation, VIPinoy at LoadMena ay ilan din sa mga masugid na tagasuporta. Kabalikat na samaha ng PEBa ang Patnubay Riyadh at Blas F. Ople Policy Center and Training Institute.